ONE of Sidney Nolan’s iconic Ned Kelly paintings will be sold for the first time following a decision by the artist’s daughter to auction the work, which has been in the family for almost 60 years. Ned Kelly: Crossing the River (1955) is expected to fetch between $800,000 and $1.2 million when it goes under the hammer on November 20 at Sotheby’s sale of Important Australian and International Art. According to the auction house, viewing of the work in Sydney and Melbourne during the next fortnight marks the first time the work has been on public exhibition — and on Australian shores — since 1975. Crossing the River, which is part of Nolan’s second Ned Kelly series, has spent the past three decades at the Boston home of Jinx Nolan, the daughter of Sidney and Cynthia Nolan. The painting depicts the Victorian outlaw wading through a swollen river holding a firearm above his head. Jinx Nolan, who inherited the painting upon her mother’s death in 1976, said selling the work was not an easy decision. 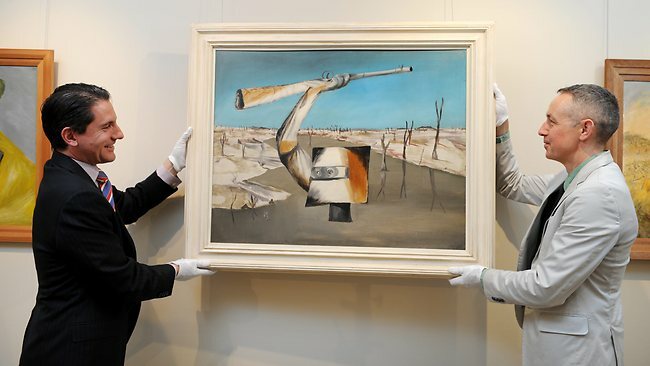 Sotheby’s chief executive Geoffrey Smith said the work was an integral part of “arguably the most internationally known series of Australian art”. He said that was borne out by examples of the series at New York’s Museum of Modern Art and Britain’s Tate Museum. The NGV in 2010 acquired Ned Kelly with Horse (1955) for $2.5m, while Nolan’s famous Kelly painting First Class Marksman (1946) was sold the same year for $5.4m, a record price for Australian art sold at auction. Smith said Crossing the River was notable for its compositional clarity. The work is on view in Sydney this week, before travelling to Melbourne where it will be on public display until the auction. Smith, who in 2003 curated a survey of Nolan’s work at the National Gallery of Victoria, said he was unconcerned about launching the work into a softening market. “For works of great rarities and significance, we are finding there is great interest and depth to the market,” he said. Crossing the River, which Nolan showed in exhibitions in London and New York in 1965 and 1966, was last seen in Australia in 1975, when it was part of The Cynthia Nolan Collection of Paintings by Sidney Nolan, which was shown at Sydney’s David Jones.